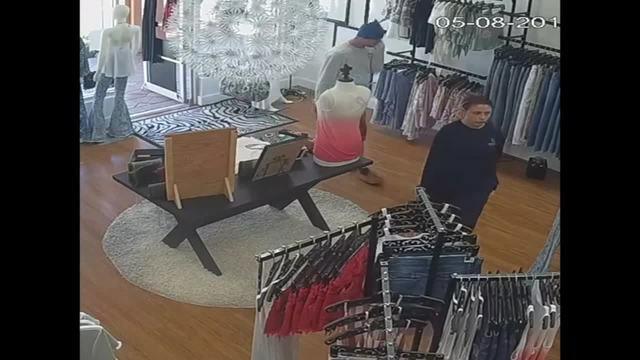 A couple accused of robbing a Jupiter boutique and stealing cash has been caught, according to a Jupiter Police report. Jupiter Police officers say Makenzie Rogers and Matthew Larson passed a note to an employee at Chic Boutique demanding money and ordering the employee to not call 911. Store surveillance video captured the suspects, identified as Rogers and Larson, going inside the store at 5500 N Military Tr on May 8. Rogers is seen handing the employee the note while Larson stands by, the report states. The employee said she handed them $152 in cash from the register. She then called 911 after the couple ran from the store. An officer found Rogers and Larson inside of the McDonald’s in the same plaza not long after to responding to the scene. Rogers and Larson had changed their clothing but otherwise matched the description of the suspects provided by the employee, an officer wrote in the report. Officers report later finding the shirt Rogers wore at the time of the robbery in the shopping plaza. The couple allegedly confessed to police, admitting to robbing the store for money for their substance abuse problem. Officers arrested Rogers and Larson for robbery and booked them into the Palm Beach County Jail. A Palm Beach County judge set Roger’s bond at $5,000 and Larson’s bond at $50,000 Wednesday morning. They are ordered to not have contact with Abacoa Plaza.